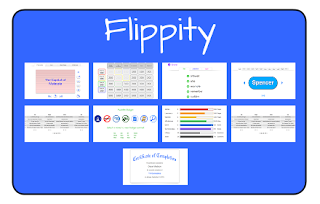 Flippity.net is a series of web apps that can easily turn a google spreadsheet into a set of online Flashcards or Quiz Show. There are cards for helping a teacher create random groups, or mix and match activities. Students accomplishments can be tracked using the Badge Tracker and the Certificate Quiz. There is even a Spelling Words that can read the word to you. These great tools from Flippity.net were created and are maintained by Steve Fortna, and now available as an add-on thanks to a partnership with Bjorn Behrendt of Edlisten.com.